With the Greenstar Pro, you can juice a wider variety of fruits and vegetables – from carrots and apples, to wheatgrass and leafy greens, all without having to stop and change any parts! 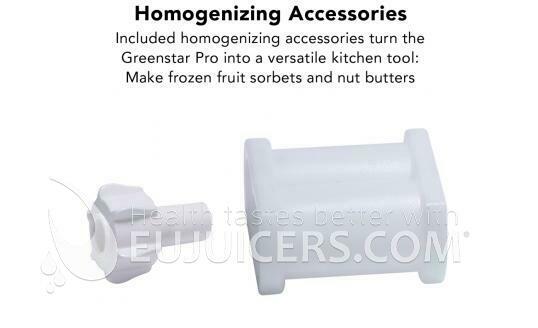 You can also use your Greenstar Pro Professional Juicer to make other delicious foods including peanut butter, pâté, frozen fruit sorbet, salsa, and more! 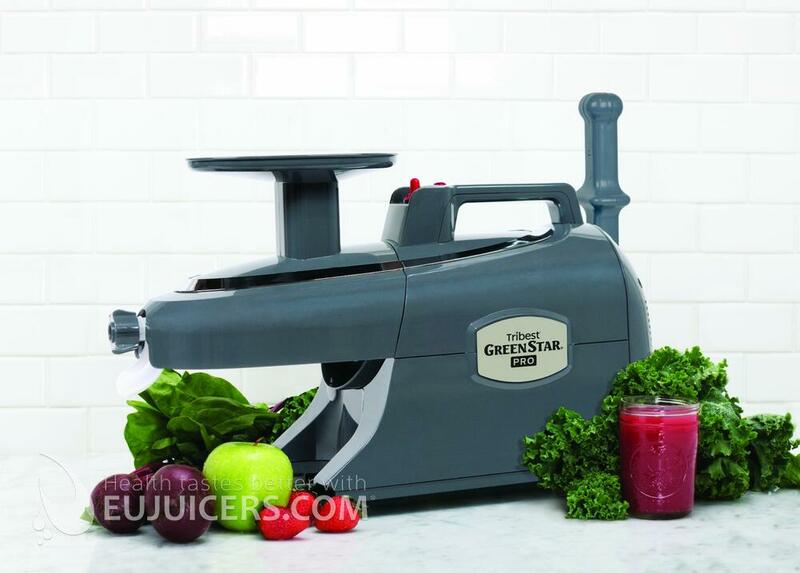 The Greenstar Pro Professional Juicer unleashes the very best nutrition that nature has to offer, utilising advanced All Stainless-Steel Jumbo Twin Gears to get the most out of all your fruits and vegetables. The new twin gears are coupled with other design improvements that make Greenstar Pro easier to set up, easier to use, and easier to clean than ever before. 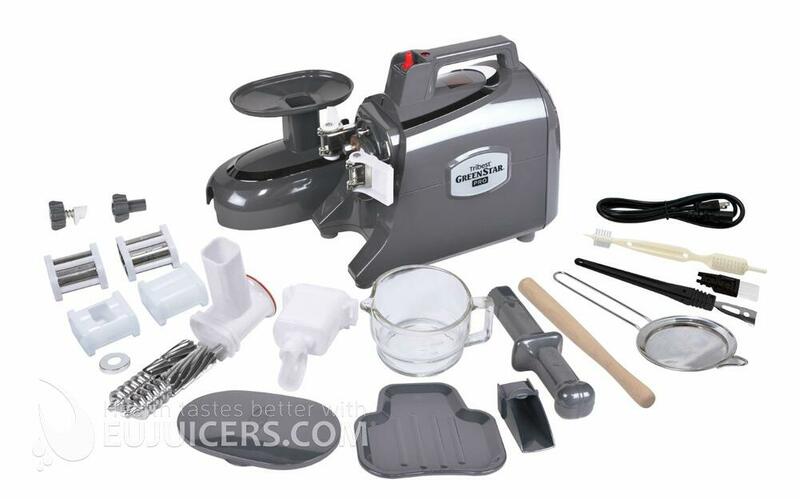 Included are 4 different juicing and mixing screens, two pushers (wooden and plastic), a glass juicing bowl, stainless steel pulp strainer, cleaning brush, metal cleaning tool, and more. The 100% stainless steel twin gears have been redesigned to create a three-stage juicing process, adding a mixing stage between the crushing and pressing stages. This results in higher yield, especially with soft fruits. 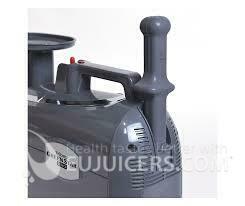 They rotate at a low 110 rpm to ensure a cold-press juicing process. 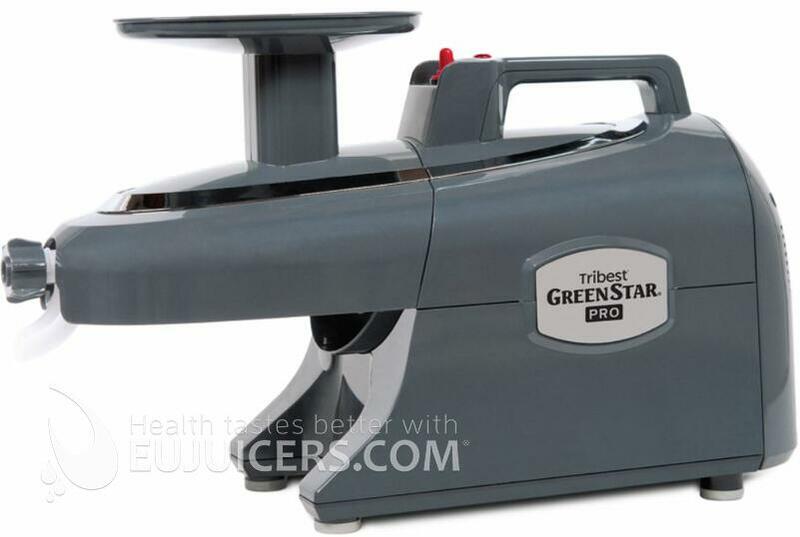 The Greenstar Pro also has magnetic and bioceramic technology embedded in the gears that produces fresher juice that can be stored longer, with minimal loss of the precious enzyme and vitamin content in the juice. In additional to the jumbo stainless steel twin gears, the Green Star Pro offers a myriad of improvements over the Elite model. The cooling system has been upgraded, allowing for heavier-duty use. Small things like an integrated holder for the pusher and a redesigned outlet adjusting knob makes the juicing experience even easier. There are more similarities than differences between the Greenstar Elite and the Greenstar Pro. The main difference is that the Pro model is certified for commercial use. 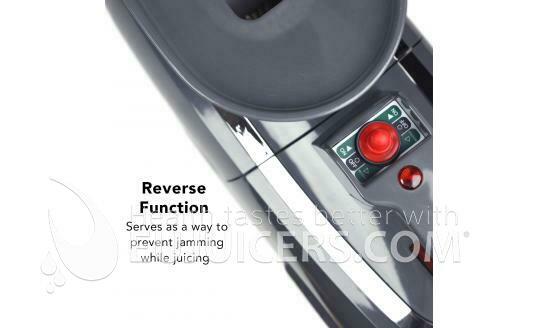 While the motor has the same power output and rpm, it has been upgraded with heavier-duty cooling. The most obvious difference is in the dual augers, which are now entirely stainless steel like an Angel juicer, versus the stainless steel/nylon combination on the Elite model. We found the performance between the Elite and the Pro to be very similar. 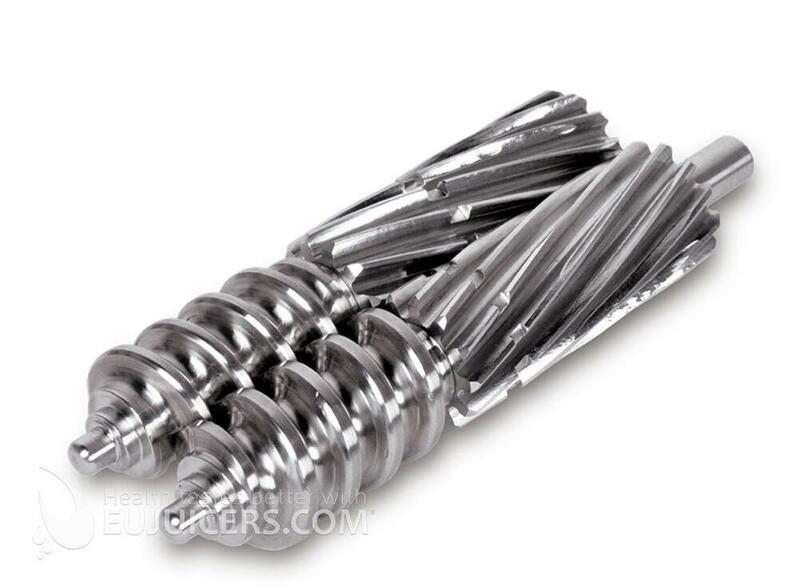 Like all Greenstar models, the augers have a magnetic and bioceramic core to maintain higher levels of minerals in the juice, although we cannot verify this claim. Overall the Greenstar Pro gives a very high yield of pulp-free juice, and may be the easiest dual gear juicer to use and clean, thanks to the simple assembly and 100% stainless steel augers.